Dutch composer Michel van der Aa has won the 2013 Grawemeyer Award for Music Composition for his multimedia work Up-close, which offers a unique blend of cello concerto with film. 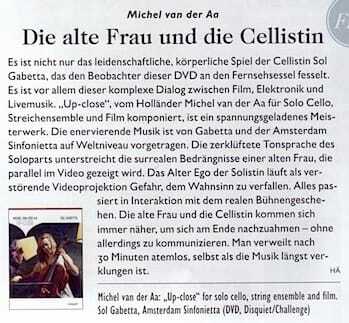 Michel van der Aa, aged 42, wrote Up-close for the Argentinian- French cellist Sol Gabetta and the Amsterdam Sinfonietta. The work was commissioned by the European Concert Hall Organization, with support from the Concertgebouw Amsterdam and the Performing Arts Fund. It received its first performance in Stockholm in 2011 with the Amsterdam Sinfonietta directed by Candida Thompson accompanying Gabetta as soloist. Following its premiere, the same performers toured the work to concert halls throughout Europe, visiting such cities as Luxembourg, Brussels, London, Amsterdam and Hamburg, and receiving high acclaim from both audiences and critics. 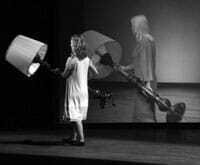 Disquiet Media released a DVD and movie download of the work in performance in 2011.